01-Sep-2001 -- The day I had decided to visit this confluence it was raining. Never the less I decided to give it a try. After consulting the Swedish map "Blå Kartan" (Blue Map) I found that there were two truck-roads taking me within 500 meters from the confluence. I decided to give the south way a try. This was also the one that had the best way taking me close. I had some luck taking this way. When I left the main road and headed for the confluence on the truck road I found that the this road had been blocked by a boom in the past. But it was open and looked like no one had been using it for years. The road was drivable but not turnable. Anyhow I came within 325 meters from the confluence. I parked and started walking toward the confluence. 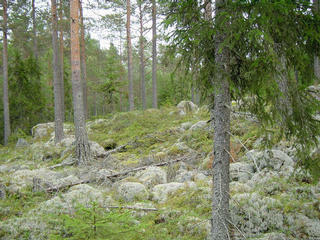 The terrain was typical for this area. Lots of moss-clad stones with holes around. I really had to make sure that I put the feet at the right spot! There was also mosquitos flying around and ticks creeping on my rain clothes. The confluence is in the middle of nowhere some 20 m from a low hill as seen on the pictures. I took pictures in the four main cardinal directions. I also took some pictures of the GPS showing where I was, I thought... As it was raining I did not dare to put the camera on a stone and use the self-timer to take a picture of me. On the way back both my GPS compass (a Vista) and my ordinary compass behaved strange. This can be seen on the track-log #5 as a slight detour on the way back. Back home I learned a lesson. My digital camera happily takes a picture even though it can not focus. All close up pictures of the GPS were un-sharp!